We did it. 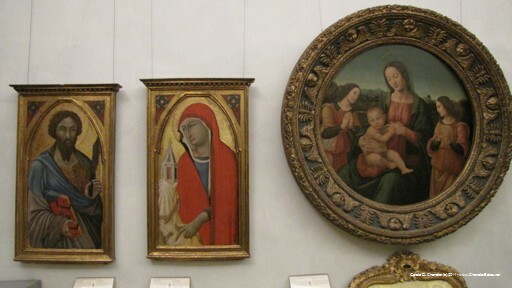 Or did all three: We finished up our stay in Florence without fuss or muss. We took the train from Florence to Rome and had a nice three and a half hour trip. And, with a little help from our friend Veronica, we got ourselves installed in Rome where we've now been for a month. Halfway through! It was quite a challenge, at least at first, as not only did we have our full load of four bags and two back packs but we also had a box of books and two bicycles, all acquired in Florence. With the help of Elisabetta in Florence we got them to the train there; in Rome Jan and Veronica walked the two bikes to our new digs while Gerry took "the mountain" in a taxi. Click on any photo below to see it enlarged. 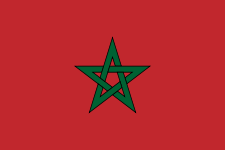 It will appear as part of a slide show of all photos on this page. The image size can be changed by clicking on the plus and minus buttons. In the upper-left corner of a slide show click on either of the small-blue triangles to see another album (sets of photos). 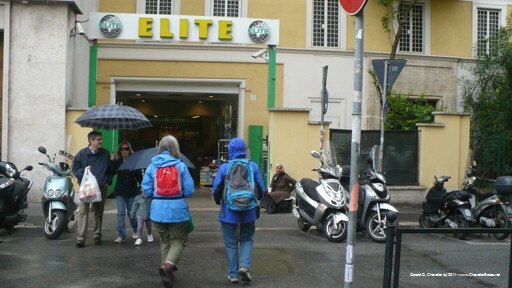 One of the albums is of us in Rome (and some of our food). Two more show us in Florence in January-February and us in Florence in March-April. Our last post was made when we had a month left in Florence. 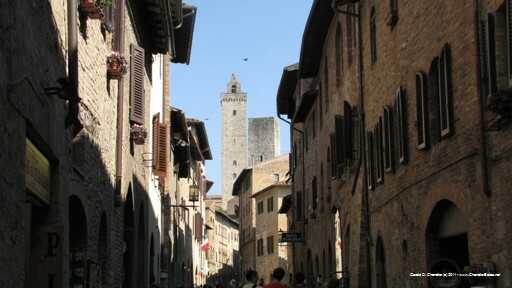 By that time we'd made day trips to Lucca and Sienna. In our last month we were very busy with out of town trips, adding Montespertoli, Pisa, San Gimignano, Bologna, and Prato, The first is the country home of Franco Vannini, a local artist. We were invited there for an afternoon and lunch. 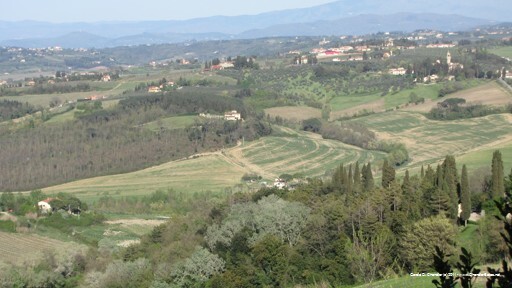 We went by car and got to appreciate up close the rolling hills of Tuscany and it many villages. For the others, the drill was always pretty much the same: Get up early and take the 23 bus to the station, Santa Maria Novella. Jan would go to the in-station McDonalds (there is a much bigger one across the street) and get breakfast meals. Gerry would go to the automatic ticket machines and get us tickets for the trip, usually a bit more than an hour but longer for Bologna. If we'd gotten to the station early we'd have a wait; if not we'd rush for our seats. Travellers are supposed to validate their tickets — that means time-stamp them in a machine so they can't be used for additional trips. One time we forgot completely and had to sweet-talk the ticket-taker. Another time we forgot and had to rush off the train to validate, worrying that the train was about to depart. On every train but the Bologna train it was easy to find a seat. We had to sit in the hall half way to Bologna and most of the way back. To our great regret it was only when we were halfway back to Florence that we realized (it's written in Italian, after all) that we had reserved seats both ways. Unlike Florence, where we didn't have visitors until we were more than half-way through our stay, we started Rome with a visitor: Veronica. Over the twelve years that we have been traveling Veronica has switched from being a friend of a friend to being a friend. Way back in 1999 we stayed in her place in Paris while she went off on the St Jacques pilgrimage to Compostello; since then we've taken her place almost every other year for three months. In just two more months we'll be back for another three months. In 2010 Veronica was walking from France to Rome, along the Via Francigena, a route that she was instrumental in bringing back to life for the modern pilgrim. She left Siena one morning with hardly two weeks to go before she was in Rome; unfortunately hardly out of Siena she was crossing a field and twisted both ankles fracturing one and severely spraining the other. Many said that she would never make a long trip again. But she is a persistent and hardy person and went at her therapy with serious concentration. Less than a year after the accident she was ready to pick up where she left off. 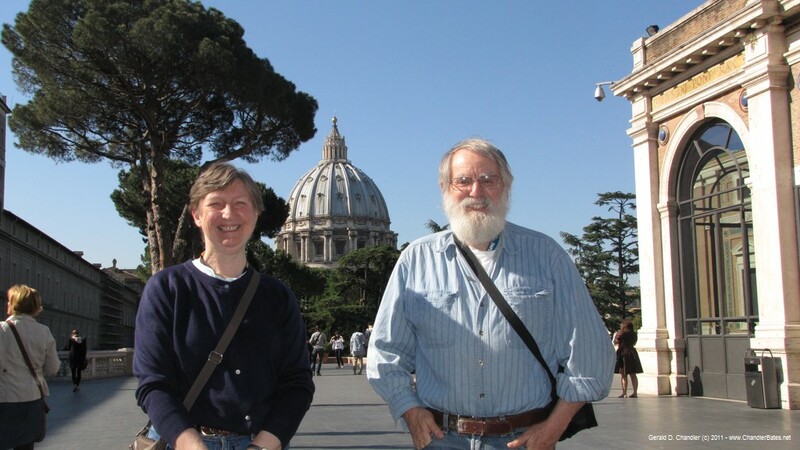 Because Pope Jean Paul II was to be beatified on May 1 in Rome and because Veronica is a devout Catholic, she decided to attend the ceremonies and then head for Siena to complete her Rome walk. And that is what she did. First, we hosted her in our digs for the days before and of the ceremonies; then, after an absence of nearly three weeks, we welcomed her back to Rome. When she was one day's walk away we took the train out to greet her. The next day, early in the afternoon, she rang our buzzer and was back with us. It's easy to understand why Pope John Paul II is popular. At least it is if you are familiar with his life and have seen him in action. For most of the time that he was pope we weren't as intimately acquainted with him as we have become here in Italy. As it happened we'd hardly arrived in the USA in 1978 when his predecessor died and he became pope. There must have been some coverage of his life on TV but we can't be sure we saw it; if we did it is now long forgotten. And it certainly wasn't the center of our attention: Gerry was getting re-integrated into the USA after six years away and Jan was learning about it as a new resident, or more precisely, being overwhelmed by it. In Florence we watched TV almost every night. In the last weeks before we left there there was much coverage of John Paul's life. We saw a made-for-TV movie that gave emphasis to his experiences in pre-War Poland and under Nazi occupation. And we saw a three-part documentary about him. It helped greatly that we'd made enough progress in Italian to follow the major parts of what he had to say. He was indeed charismatic. Hearing that Veronica, who had made so many pilgrimages, was coming to Rome for the Beatification we advanced our arrival by a couple of days to share it with her. That would avoid the travel crush that may have happened on May 1, allow us to see Veronica, and to take advantage of her as a guide to the events. On May 1 we got up early and headed for St Peters. It wasn't early enough. Our lack of knowledge of the Rome bus system meant that we waited on the wrong corner before going to the right stop. Then we had to walk about a mile, which took more time. As we approached St Peters we also approached a gigantic crowd, whose members were all like us: wishing they could get to Piazza San Pietro (in front of St Peters) and see the beatification mass direct. But we, like they, reluctantly had it forced on us that we'd be among those who had no line-of-sight and instead listened to one of the many loudspeakers; we weren't even in a position to see one of the giant screens. But it was a happy crowd, and we were among the happy (if disappointed) ones who passed our two hours knowing that it would create a lasting memory. It was particularly heart-warming to be offered a stool to sit on by complete strangers who seeing our grey hairs decided to be generous. The next morning Veronica departed very early for Milan. We were up and saw her off. Then, we thought, "Why not try for the Thanksgiving mass this morning?" 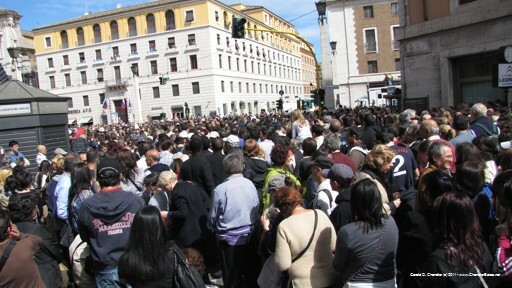 Just one day had taught us enough to get there in time to be in Piazza San Pieto. We've gone to many masses in our lifetimes and so we know the sequence well. But we'd never before seen such a colorful carrying out: We saw fifty or more priests in ceremonial white robes — we imagine cardinals or bishops — come into the square and make their way to the altar. 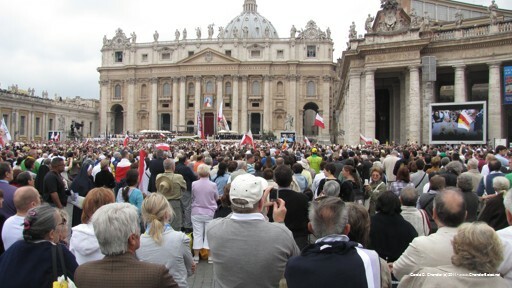 The service was all the more impressive for being on the steps of St Peters. We don't really listen to much music on our travels. Don't get us wrong: we both like music and both have plenty of music on our media players. But it rates a third to watching TV (particularly political stuff and also crime soaps) and reading (or listening to audiobooks, which is almost the same thing). So it was something of a novelty that we went to three concerts on three successive nights. 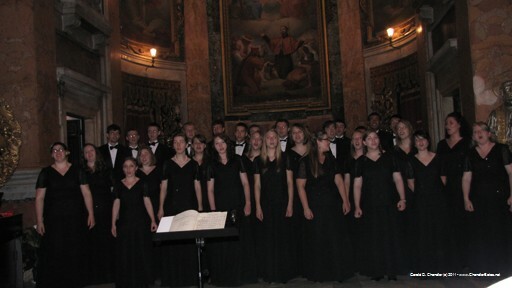 The first was a performance by an American choir from Missouri's College of the Orzarks. 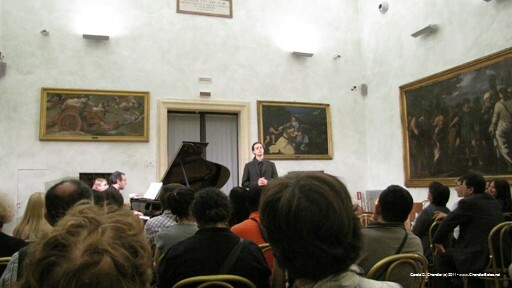 The second was a short concert of opera arias that was part of the free night at the museums; each came from an opera with Seville in the title. 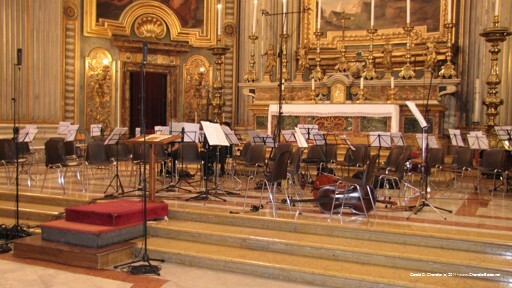 The third was a performance of a Domenico Bartolucci's 1942 oratorio La Passione, telling the story of the Passion of Christ. All the performances were in a wonderful setting (two churches and a museum), but we both enjoyed the Seville arias the most, although they had the least glorious setting. In the first week of our stay, we were at the closest bus stop to our apartment, less than two full blocks away, when we noted a low bill board — it was really a meter high panel on the sidewalk - advertising the Internazionali BNL d'Italia Master's Tennis tournament that would start in just a few days time. It had Federer's picture on it, so we knew right away it was a big tournament. Immediately we wanted to go — but would there be any tickets left? If it had been Wimbeldon in London we'd have known there was no chance. Or if it had been Roland Garros in Paris the pickings would be slim. But both of those were part of the Grand Slam circuit and the Rome event was just a Masters. So we decided to give it a try. That was the right decision. 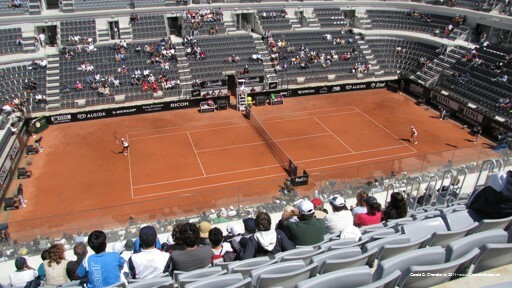 On our first try, the first day of the tournament, we easily got tickets to the main stadium and got to watch a pleasant day of tennis even if not exactly world class. 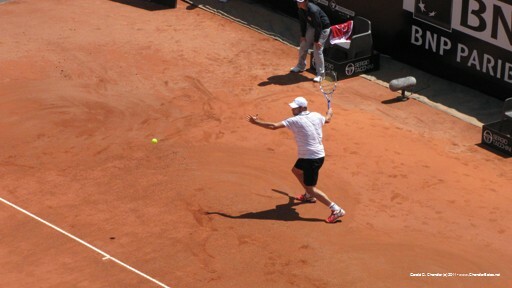 We did get to watch a seeded player, Andy Roddick, but sadly he lost. It didn't matter, it was just so nice to be sitting in the open air and watching tennis again. We will miss both Wimbledon and Roland Garros this year and are keeping fingers crossed that we will get to see some coverage of the US Open while in Paris. Of course we did lots of the usual tourist things to. To paraphrase the famous poem, "let us count the ways ... we visited the great sights". Almost every day we visited two or three beautiful churches. 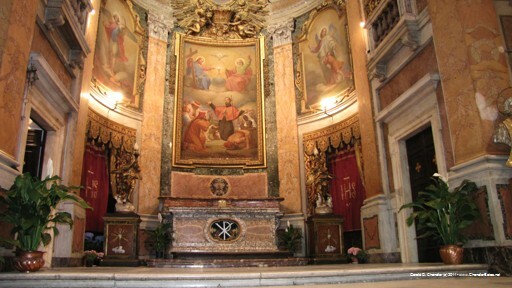 There can never be an end of humanity's creativity and that is more than confirmed by Rome's churches. 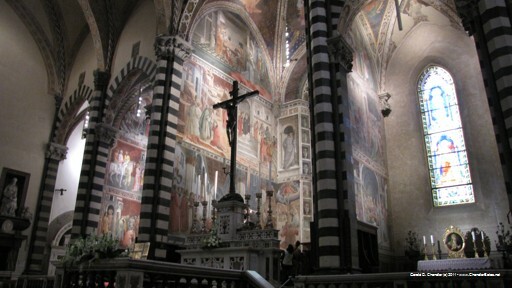 We saw loads and loads of lovely churches in Florence; they were mostly 13-15th century ones. Rome, in a sense, picks up where Florence left off. 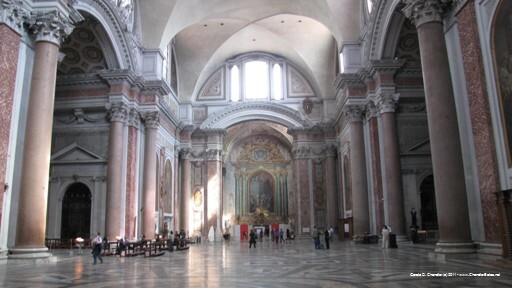 While the original Roman churches were founded as early as 300 AD nothing or next to nothing of that remains. Most of what one gets to see is 16th century and later. 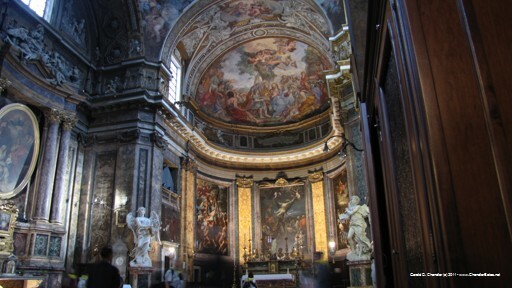 That certainly applies to St Peters, which we saw, but also to all of Bernini's work and gads more. So far we've been to comparatively few museums. They've been overwhelming because we have the luxury of having the time to be overwhelmed by them. 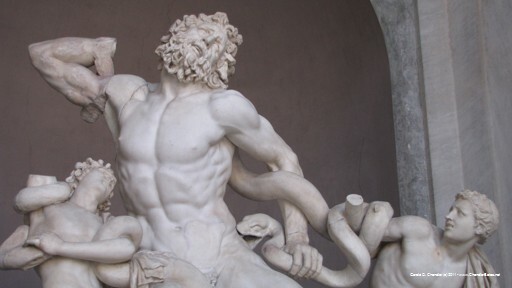 The Vatican museums are a world of their own. The Capitoline Museum is, like the Vatican, a work of art as a building as well as a container of works of art. The same is also true of the Galleria Borghese, which is not to be missed. We saw a wonderful special show of Lorenzo Lotto's works at the Scuderie, a former stable converted to hold temporatory exhibitions. It was our first introduction to the artist that left us very impressed, just like the exhibit in Florence that introduced us to the works of Il Bronzino. It is all part of the terrific art education we are getting here in Italy. We got to see a small part of the Presidential Palace, the Quirinale, because there was an exhibit there with just eight works, all of them of the Madonna, and two of which we'd seen already in Florence. An amazing thing has happened. Jan has been reborn — again. Gerry says it reminds him of his experience. What's up? New glasses! We're both intermittent glasses wearers. Like the man who could eat no fat and the wife who could eat no lean, together we lick the visual plate clean: Without glasses Jan can see far but not near; Gerry is the opposite. Around the house and indoors he wears his glasses so little that one friend of many years was surprised to learn (at last) that Gerry even wears glasses. For some years now Jan has worn reading glasses. In the States she always got prescription glasses, but since we started travelling she has found that the off-the-shelf reading glasses are good enough. Year-by-year, however, she has need stronger and stronger glasses and lens quality started to become more important; so two years ago she gave in and got her first pair of prescription glasses in about eight or nine years. The worst news is that her distance vision has also been deteriorating. Not to the extent that she could not drive or see things almost as well as Gerry with his glasses, but things had noticeably deteriorated. 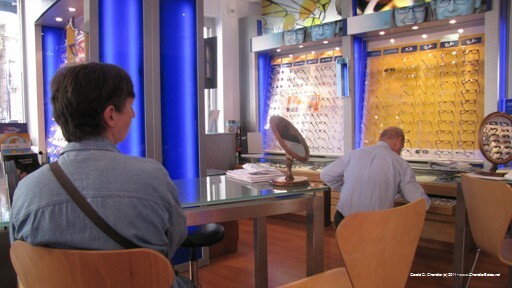 A brush with viral conjunctivitis forced her to visit an opthalmologist in Florence and out of the visit came a prescription for distance lenses. Two weeks ago Jan ordered a pair of variable-focus glasses. The goal: to see, and see without constantly changing glasses. After a bit more than a week — modern technology intrudes again — an SMS arrived: they are here. She picked them up, and lo and behold, she discovered there is a detailed world out there. In churches she can see the details of the decorations on the roof. In museums she can read the tiny signs that museum curators put on the bottom of cases. Who was to know? Her only regret: she didn't get them soon enough to really appreciate the Tornabuoni chapel in the church of Santa Maria Novella in Florence. We'll be taking mostly trains and the exact train route is not shown. We've been getting ourselves amazingly well organized. It is partly due to the fact that the Internet makes it possible (one can plan in advance) and it makes it necessary (if one doesn't plan in advance there won't be any hotel rooms left). 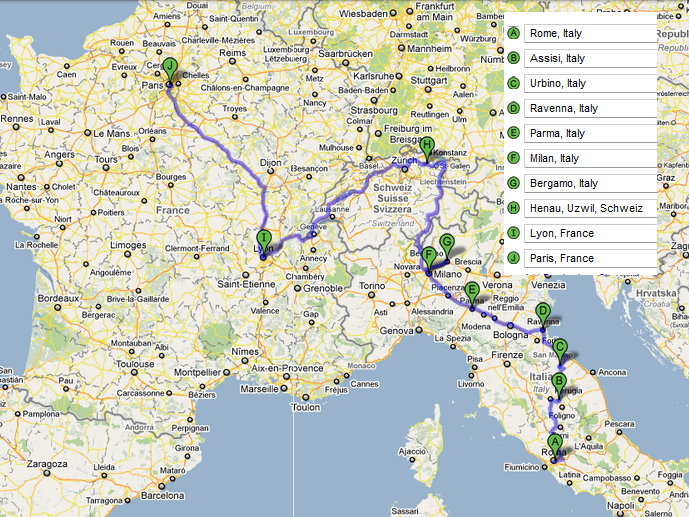 Starting about two weeks ago we began tieing down the details of what we would do in the month between Rome and Paris. 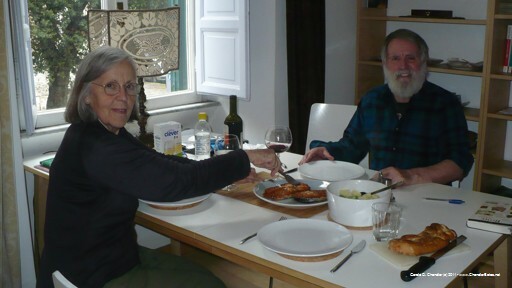 We'd been invited to stay with Sandro and Yvonne ( see March 31) in Switzerland. How would we get there? What would we do afterwards? The dates and places are now set. We knew all along what the general route would be in Italy; it's shown nearby in the map. Visiting Assisi was a must as was Ravenna. Both get three stars from the Michelin Green guide. Milan had a double reason to be visited: it also gets three stars and it's the easiest way to get to Zurich and on to Henau. Given that we're on an art kick and that Urbino was home to Raphael and is half-way between Assisi and Ravenna we picked it. (It wasn't until after we made our hotel reservation that we learned going only 100 km would take half a day.) 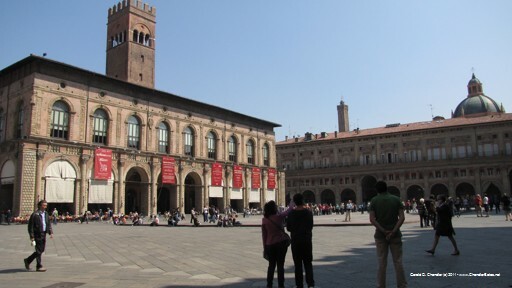 Parma was chosen for similar reasons: we wanted to stop between Ravenna and Milan and had already spent a day in Bologna. The cherry on the cake is Bergamo. We went to a special exhibit on Lorenzo Lotto and learned he spent a good deal of his life in Bergamo and that many of his works are still there. When we checked and found out Bergamo was at the foot of Alps we were sold. We're happy that we'll be working our way north: Rome is almost too hot for us now and by departure date, July 1, is will definitely be too hot. Before we got the Rome apartment thought of going to Sicily and that would have been okay for May, but later would be too hot for us. We toyed with going to Sicily after Rome but that was really a no brainer: NO! Assisi and Urbino, our first stops, are up in the hills and for that reason they should be a bit cooler than the Rome we leave. The same goes for Bergamo and, we hope, Milan. We'll just have to suffer though low-lying Ravenna and Parma. Further north, in Switzerland and France, everything should be fine weather-wise. We'll be in the high-lowlands and the low highlands of Switzerland. In France we'll spend five days in Lyon before we're off to Paris. Paris should be fine; we hope that Lyon will have a cool spell.